The "division problem," as it was commonly called, took on many iterations between the 1300s and 1600s. In essence, it sought the answer to a question like this: If a game of chance between two or more players must end prematurely, what's the fairest way to divvy up the winnings? Niccolo Tartaglia, a famous 16th-century mathematician and pioneer in ballistics, wasn't sure the problem would ever be solved, proclaiming, "In whatever way the division is made, there will be cause for litigation." Three centuries of failed solutions all shared the same fatal flaw... They were focused on what had already happened to bring the game to its current state. They did so by focusing not on how the game had already transpired, but rather on how the game might have continued had it not been interrupted in the first place. In other words, Pascal and de Fermat correctly shifted their mathematical analysis to the future – the number of rounds still needed to win to secure victory – rather than focusing on how many rounds had already been played. Today, the Frenchmen are widely heralded for discovering the theory of probability. "What is it that distinguishes the thousands of years of history from what we think of as modern times?" That's the provocative question author Peter L. Bernstein asks in his excellent book, Against the Gods: The Remarkable Story of Risk. After all, any student of history knows that many of the things we take for granted in our modern world have been, as he describes it, "at the service of human beings for millennia." In Bernstein's view, the answer to his question is the mastery of risk. By finally solving the game-of-chance question that had so confounded their predecessors, Pascal and de Fermat empowered people, for the first time in history, to make decisions and forecast the future using numbers. Their "intellectual dynamite" set off a chain reaction of risk-related innovations over the next century, including such things as life expectancy tables, marine insurance, and annuities. Virtually all of the tools we use today to analyze and manage decisions, choices, and risk were first developed between 1654 and 1760. When it comes to investing, few things are absolute. But one that will never change traces its roots back to the days of Pascal and de Fermat... The value of a business is the present value of all of its future free cash flows. Or, as the late economist Irving Fisher so eloquently summarized, "Capital value is income capitalized, and nothing else." In other words, to estimate current value, you have to look forward (like Pascal and de Fermat did), not backward to what has already happened. As Rupal Bhansali, chief investment officer at Ariel Investment, says, "Investing is ultimately about figuring out the unexpected, because the expected is already in the price." The valuation challenge facing every investor is clear... To earn market-beating returns, you must correctly anticipate changes in future cash flows that aren't currently reflected in the stock price. What if there was a way to precisely understand what expectations were already reflected in a stock at a given price? Knowing this would provide a much-needed value anchor that investors could use to imagine and measure alternative outcomes. Well, it turns out there is. Michael Mauboussin, one of the greatest investors of our time, co-authored a book about it in 2001, titled Expectations Investing. As Mauboussin explains in the beginning of the book, "Stock prices are the clearest and most reliable signal of the market's expectations about a company's future performance." Over the next 200 pages, he lays out a framework for deciphering what current prices say about the expectations for key valuation inputs (like revenue growth and free cash flow). Expectations investing helps you stack the odds of success in your favor. It does this by quantifying expectations in a way that the most commonly used valuation techniques – comparing multiples, like price-to-earnings ratios or EV/EBITDA ratios – can't come close to matching. Management had recently announced slower-than-expected same-store sales growth at the international coffee chain, and shares were down about 15% on the news. Using our own price-implied expectations model, we quickly concluded that investors were overreacting. At $52 per share, investors were forecasting zero revenue growth for the next few years. This made absolutely no sense to us. Though sales in existing stores were slowing, they were still growing. Additionally, the company had big plans to launch new stores across the U.S. and China (and had the capital to do it), thereby creating new sources of revenue. Where expectations investing really shines is helping quantify a margin of safety in a stock at its current share price. Ideally, we're looking for a situation where investors have given up (limiting our downside), but we're confident the business offers considerable upside without much having to go right. This was precisely the setup we saw in Starbucks last summer. After developing a sophisticated valuation model of the business, we concluded that even if we dramatically dialed back some of management's lofty growth expectations, the stock could rise 40% over the next two years. With shares already trading near three-year lows and the bar for growth expectations set low, Starbucks had limited downside and significant upside. As it turns out, Extreme Value readers taking our advice only had to wait a few months for the upside we saw to play out. In November, the company posted better-than-expected growth results and shares immediately surged 12%. Today, they're trading around $69... just a few percent away from where we expected shares to be trading within two or so years. It's important to note that seeing the upside in Starbucks shares last summer wouldn't have been obvious by looking at its price-to-earnings ratio, which was in line with the S&P 500. To really quantify the opportunity, we had to dig a lot deeper. So, what does expectations investing tell us about the market today? Each month, Dan and I evaluate dozens of new stock ideas, building expectations models for many of them. Lately, I'm finding expectations for revenue growth and/or profit margins generally remain high across the market, even after the big fourth-quarter sell-off. Then, the growth story began to crack, financial results started underperforming expectations, and the share price tumbled. That's good news for value-oriented investors. You want to buy when expectations are low, provided you think the outlook for future growth is stronger. The biggest problem is that expectations for Nvidia's operating and free cash flow margins remain very high. This is a significant risk. When management recently pre-announced fourth-quarter results, it noted the adjusted gross margin would be below its previous guidance by about 6.5 percentage points. This means operating and free cash flow margins are also likely to decline significantly. But investors are still inclined to give Nvidia the benefit of the doubt. They've dialed back growth expectations, but they don't expect the slowdown to materially hurt profitability. 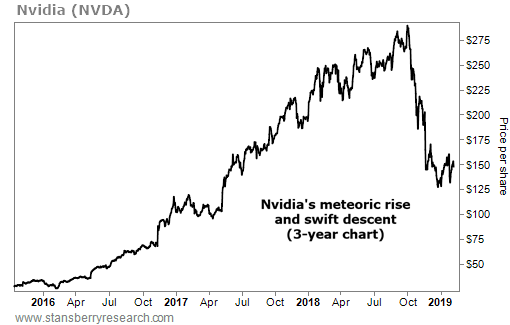 For value investors seeking a measurable margin of safety, Nvidia doesn't appear to fit the bill, even though shares have pulled back lately. In his latest book, Mastering the Market Cycle, investing legend Howard Marks reminds readers that the odds of success change as we move across the investment cycle. Take another look at the chart above. Anyone who bought at the beginning of this particular cycle would still be sitting on a five-bagger today, even after the recent decline. Expectations were low, and the margin of safety and odds of success were high. But buying the stock later in the cycle, like back in October, when expectations were high and the odds of success were much lower, would have been disastrous. Situations where the odds of success are clearly stacked in your favor remain few and far between today. And as stocks have bounced higher from their late-2018 lows, expectations have, too. That doesn't mean stock prices can't continue to move even higher... But to do so, they'll have to beat already-high and rising expectations. So should you be bullish or bearish today? That's a question only you can answer. Next Wednesday, February 13 at 8 p.m. Eastern time, they are hosting the 2019 Bull vs. Bear Summit. There, you'll hear from some of the most prominent bulls and bears in our industry, who are coming together for one night to reveal exactly what they think you should do with your money today. We'll even hear from some of Stansberry Research's top analysts, including Steve Sjuggerud and Dan Ferris. This event is completely free to attend. Reserve your seat right here. Editor's note: It's anyone's guess as to which way the markets will go from here... But that doesn't mean you have to be caught off-guard. To help you prepare for what's coming in 2019, our friends at TradeSmith are hosting their first-ever Bull vs. Bear Summit on Wednesday night at 8 p.m. Eastern time. Sign up for this FREE online event right here.